We are at an interesting crossroads in history where a perfect storm of crises is going to create significant, rapid change. Many commonplace parts of modern society will hit their peak and then not instantly disappear, but undergo a decline. How slow or swift the decline will be depend on the circumstances as well as various levels of corruption and/or government intervention (assuming the two aren’t synonymous.) Sometimes the peak may be a temporary one, if we can manage to reorganize ourselves and our resources in a sensible manner. Some of the descents, however, are permanent or at least will last for several generations. The financial crisis is all around us and will last at least another five years, if not ten. 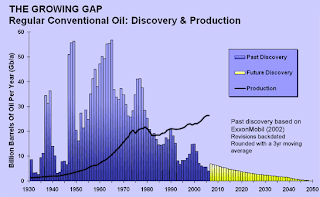 World Peak Oil already happened in 2005 (U.S. Peak Oil was in 1971), and world crude oil production is in gentle decline hidden by demand drop due to the recession. The oil crunch will strongly hit in 2013 (or sooner, if anyone decides to airstrike Iran.) And then there’s climate change, the ultimate humdinger that’s awfully hard to predict anything about except that it will likely cause drought, famine, flooding, forced migrations, massive species extinction and a lot of death. But given its uncertainty and longer timeframe (ooh, maybe fifteen or twenty years before the real onslaught of effects) let’s not worry about that one just yet. Let’s get back to our immediate Peaks—Finance and Oil—and the other Peaks related to them that have appeared or are soon to appear on the near horizon. Now perhaps you believe Peak Oil is a hoax made up by oil companies and/or environmentalists. Perhaps you think the financial crisis is on the way to recovery and another happy finance bubble is around the corner. Even so, just as an intellectual exercise, let’s pretend there’s less oil and financial wealth ahead for the vast majority of the human race. What would be the result? It doesn’t necessarily lead to Peak Remodeling. Nor Peak Housing Density. Nor Peak Urban Infill. Nor Peak Family Camping. Nor Peak Knowledge, Peak Community College, or Peak Internet Connectivity. Anything that can be transferred digitally—data, news, movies, video games, magazines, books, music, etc.--probably will not peak soon, though its hard copy form probably already has. This is not to say there will be much profit in any digital media, however. But not peak rail, bicycle, boat travel or freight. Not Peak Public Transit. Not peak energy efficiency. Not peak alternative energy. Not peak vegetable gardens, chicken and goat raising, or beekeeping. Not Peak Food, Water, or Energy Prices. Not Peak Ceiling Fans, Peak Attic Insulation, Peak Solar Hot Water Systems. Not Peak Resiliency or Peak Self-Sufficiency by any means. But not Peak Food Stamps (otherwise too much social unrest). Probably not Peak Lottery as it’s a way for people to gamble cheaply. Not Peak Retirement Age (for a while). And not Peak Family, Peak Community, Peak Relationships. These will be on the increase. Unfortunately, not Peak Homeless, Peak Crime, or Peak Disease. Sadly, probably not Peak World Population until Peak Famine hits first. Does Peak Energy lead to Peak Fertilizer which very quickly leads to Peak Food, even here in the U.S.? Let’s hope it doesn’t come to that. Long term, Peak Arable Land due to climate change is going to be bad enough. As I said above, many of these peaks don’t have to be permanent. They could be temporary downslopes creating local peaks until we retrench, reorganize in a way that makes sense given our resources, and then we can go forward again. Some of these Peaks in my view are beneficial; some are going to cause a lot of suffering that is doubly sad due to the fact that, with some foresight, we could have avoided them. In general with this list I’m not saying what should happen, just what is likely to happen as I gaze into the Peak Crystal Ball.